The MARTA Police Department is enacting its annual simulated full-scale training exercise on Sunday, Sept. 13 at the MARTA Airport Station. “Operation Destination Disaster (D2) is designed to evaluate emergency response capabilities in the event of an actual threat to the system. 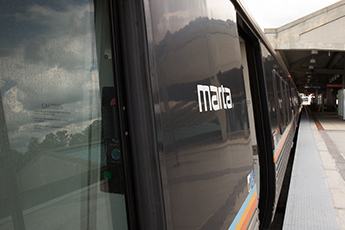 MARTA train service at the Airport will be temporarily discontinued at the end of revenue service on Sept. 12. A bus bridge will be located at the Airport Station West Curb/Ground Transportation to take customers to the College Park Station. Customers driving to the College Park Station will have parking access in the east lot. Regular Sunday rail service will resume on Sept. 13 at approximately 5:50 a.m. This training exercise provides the opportunity for MPD, MARTA staff and other emergency response agencies to address simulated incidents, such as terrorist attacks, pandemics or natural disasters in a real-life setting. The Federal Transit Authority and the Department of Homeland Security require that transit agencies of MARTA’s size conduct these exercises to assess plans and response capabilities. Media interested in covering the exercise should contact Alisa Jackson at 404.848.5157 (office), 404.804.1717 (cell) or ajackson2@itsmarta.com to make arrangements and receive credentials. Staging information will be available closer to the date of the exercise. Customers with questions about rail and bus schedules should call 404.848.5000 or go to www.itsmarta.com/schedules-maps.aspx.